Rene lalique "habanito" two perfume bottles for molinard, of clear and frosted glass, one with blue patina (worn) fitted with atomizer, c. 1929. stenciled r. lalique molinard paris france, engraved r.
RENE LALIQUE "Habanito" two perfume bottles for Molinard, of clear and frosted glass, one with blue patina (worn) fitted with atomizer, c. 1929. Stenciled R. LALIQUE MOLINARD PARIS FRANCE, engraved R. Lalique Made in France. M p. 945, No. 3. 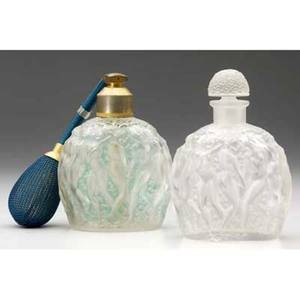 4 3/4"
Archived auctions similar to Rene lalique "habanito" two perfume bottles for molinard, of clear and frosted glass, one with blue patina (worn) fitted with atomizer, c. 1929. stenciled r. lalique molinard paris france, engraved r.
Rene lalique "roses" perfume bottle for d"orsay, of clear and frosted glass with sepia patina, c. 1912. molded lalique with extended l. m p. 933, no. 3. 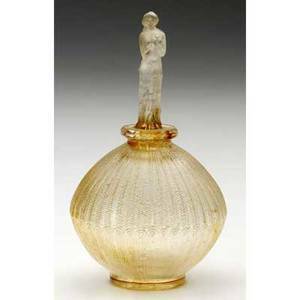 4"
Rene lalique "six figurines" decanter and single glass of clear and frosted glass with sepia patina, c. 1914. engraved r. lalique. m p. 738, no. 3158. 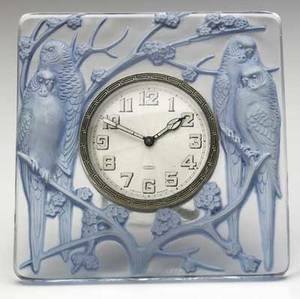 14 1/4" and 4"
"lalique inseparables dresser clock of clear and frosted glass with blue patina, c. 1926. complete with original eight-day clock. m p. 377, no. 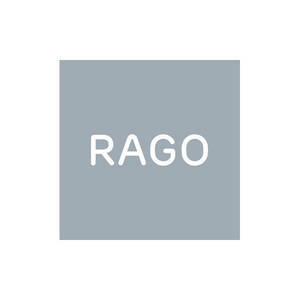 765. raised r. lalique. 4 1/4"" sq." 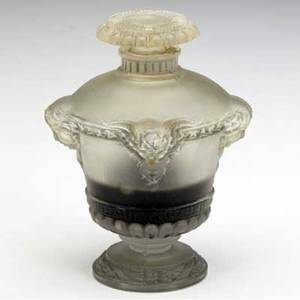 Lalique "lierre" cigarette holder of clear and frosted glass with gray patina, c. 1924. m p. 235, no. 68. molded r. lalique. 3"
Rene lalique bottle and stopper, "sirenes et grenouilles," in clear and frosted glass with green patina. m p. 737, no. 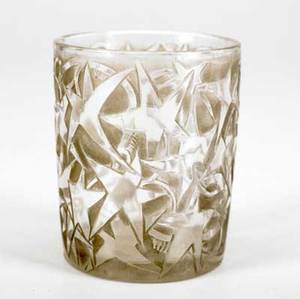 3150. engraved r. lalique france. 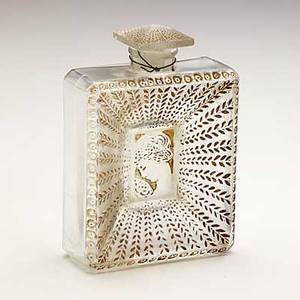 15"
Lalique; houbigant; "la belle saison" clear and frosted glass perfume with sepia patina; m p 941 no. 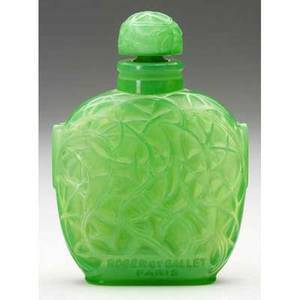 3; molded made in france r. lalique; 4" x 2 3/4"
Rene lalique "le jade" perfume bottle for roger et gallet, in jade green glass with gray patina. molded r. l. france. m p. 948, no. 15. 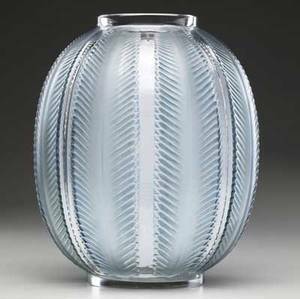 3 1/4"
"lalique biskra vase of clear and frosted glass with teal green patina, c. 1932. m p. 455, no. 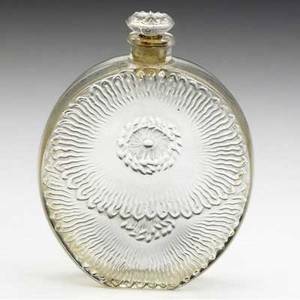 1078. etched r. lalique france. 11 3/4"" x 9"""